We know when people are meant to be together. Nic and Andy, or Nic and Baum as they’re known to us, are 2 of these people. Both the bride and groom have been long standing friends of over 10 years, however this was in our old world. Back then I was a slim, charming and witty office based type bloke. 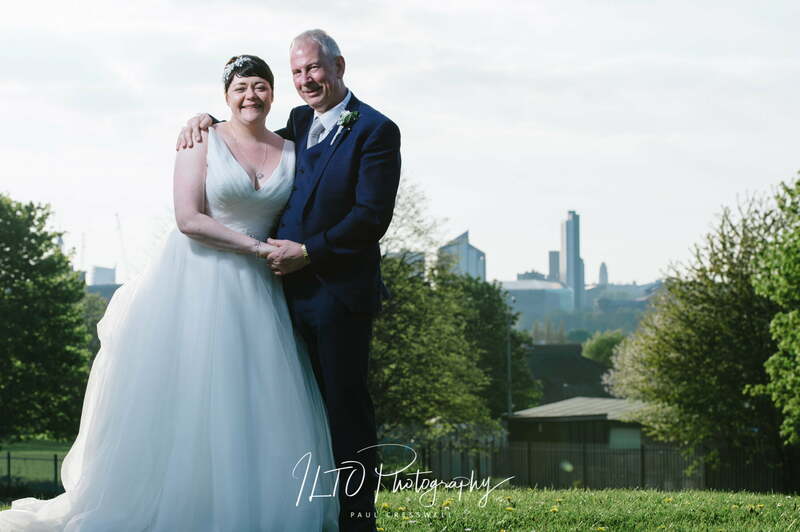 As opposed to now, where I’m a fat, charming and witty Leeds Wedding Photographer!! With Tour de Yorkshire was just around the corner from us, rolling roads blocks and traffic jams were the order of the day! Leaving early, we had plenty of time, so we headed straight for the Town Hall in Leeds, which is an awesome building! I watched Andy trying to give directions over the phone. He was pointing and saying “It’s Here!”. Regardless of their bride and groom status, they were still going to be Nic and Baum all day. Before long, we all shuffled inside. Our giggly bride had arrived in a double decker green vintage bus. Quick hello to the wonderful registrar, and things got under way. Clare and I really can’t remember a ceremony, where it seemed every word carried such weight and importance. Back to Chateaux Furbaum. Blessing by the family Priest. Speeches. DHL delivery and Strawberries from Gibraltar (thank you Sheila!). Off to a local park for some one-to-one close up stuff. Leeds sky line as a nice back drop, thank you very much! Top day. Top couple. Top guests. Knackered back and a big smile on my face …. and Clare too of course! Viva La Furbaum’s! Make sure you view photos from our other wedding blogs too! YORKSHIRE'S MOST POPULAR WEDDING PHOTOGRAPHERS 2014, 2015 & 2016!